With the introduction of the Alexa Studio, Alexa Plus 4:3 and Alexa M, by 2012, ARRI had three versions of its digital cinema cameras equipped with 4:3 aspect ratio sensors. This didn’t mean aynone really wanted to go back to the nearly square 4:3 aspect ratio in the age of HD. The idea was to facilitate digital anamorphic cinematography. Cinematographers, having lost so much control over the image with the manipulations that can be done in digital post production, looked for a way to achieve a unique organic look that could be baked in to the image. Something that could not be faked and also could not be subsequently reversed. Anamorphic optics deliver an organic, cinematic look. The use of anamorphic lenses has greatly increased since 2012. The early prototypes, which had large plain blue barrels and were labeled concept anamorphic, were seen at NAB 2012, along with the Alexa Plus 4:3 cameras. A redesigned prototype Master Anamorphic 50mm was first seen at IBC in September 2012. Production style prototypes of the 35, 50 and 75mm primes were seen at NAB 2013. First deliveries were made in early 2014. 40, 60, 100 and 135mm focal lengths were later added to the set. At NAB 2016, 28mm (T1.9) and 180mm (T2.8) focal lengths were introduced, completing the set. They are, in typical anamorphic form, a very costly set of lenses. Prices range from $43,600.- to $50,000.- per lens. A Flare Set is available for each lens, consisting of a front and a rear element with a coating that enhances flare. These elements can be exchanged with the normal front and rear elements without requiring optical re-alignment. The Master Anamorphics are part of the ARRI Zeiss Master line, meaning they are top-of-the-line products that are very nearly cost-no-object designs. They have been described as “two Master Primes in one housing”. The goal of the Master Anamorphic design was to produce a set of 2:1 anamorphic lenses with high contrast, very good sharpness, low astigmatism in the in-focus plane and minimal distortion. It is clear that these goals were achieved. The Master Anamorphic lenses have the least distortion of any anamorphic lenses I have seen. “The anamorphic squeezing is done by ‘spreading’ the cylindrical elements around and throughout the lens – not in front, not in back, but in several places. They are not based on existing lenses”. – Thorsten Meywald ARRI lens product manager. The Master Anamorphics were specifically designed as lenses for digital cinema cameras and are near image space telecentric. They are designed to have minimal anamorphic “breathing” meaning the change in both size and geometry of the image when pulling focus. These lenses have iris blades with 15 leaves to achieve a near perfect round aperture. This is important because the oval bokeh is just about the only way that you will be able to tell that a shot done with a Master Anamorphic is an anamorphic image. The typical geometric distortion and astigmatism is not present. The only complaint about the Master Anamorphics, besides their high cost, is that they are almost too good. DoP’s looking for an instantly recognizable “obvious” anamorphic look with prominent flare, distortion and same astigmatism may find that these high-performance lenses are not the best choice. Due to the very effective T*XP anti-reflective multi-coating, the Master Anamorphics are highly resistant to flare. They will flare if a bright point source is included in the frame. But the level of flare is significantly less than almost any other anamorphic prime lens, especially in terms of the reduction in contrast caused by the flare. The Flare Set can be used if a more pronounced flare effect is desired. Conversely the Master Anamorphics should be particularly well suited to feature film cinematography, where the astigmatism, distortion and excessive flaring of older anamorphic may be found to be distracting. They should be particularly desirable for anamorphic feature projects that will also incorporate visual effects in combination with anamorphic-captured live action. 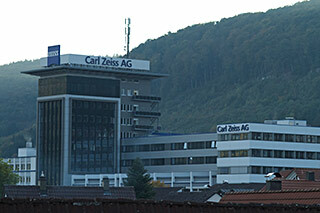 Zeiss made some good decisions in terms of mechanical design and serviceability. The optical adjustment points can be reached without major disassembly of the lens. Front elements can be changed without requiring optical re-centering afterward. The first time I needed to replace a Master Anamorphic front element, I measured the MTF of the lens first to get a baseline. I then changed the lens element complete with its housing. Theoretically the new element was supposed to drop right in without requiring adjustments. But I expected to still need to do some tweaking. I was pleasantly surprised and quite impressed when I measured the MTF of the lens post element swap and it was exactly the same. This is a great feature for serviceability and also makes the use of the “flare set” front elements practical. I wont’ shock you with the price of that replacement front element in housing, but I can give you this advice: Do everything you can to avoid scratching a lens element on a Master Prime.